You are here: Home » Events » Accessible tourism products on greenways created just to enjoy! A new brochure presents the 10 accessible tourism products linked to greenways in Spain and Portugal. 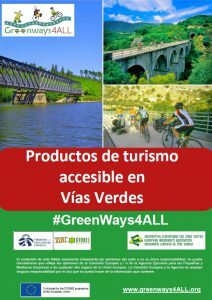 Within the framework of the European project Greenways4ALL months of work have gone into the creation of 10 accessible tourism products linked to greenways, 7 of which are situated in the two pilot territories that form part of this project, the Sierra Greenway (Cadiz-Seville) and the Ecopista do Dão (Portugal), while 3 are based on the Olive Oil Greenway (Jaen-Cordoba). This has involved cooperation between a number of companies. The travel agencies forming part of the project – Accessible Madrid, AstroAndalus, and Turismo Vivencial – previously visited all the local accessible tourism resources and enterprises of the two territories represented in this project in order to create the best accessible tourism products. It was also thought interesting to include the offer of Ecotour Turismo Accesible, a company which already featured the Olive Oil Greenway among its range of products. Sleeping in a railway carriage, watching the stars in the sky over the Sierra Morena, travelling on the Greenways of Andalusia and the centre of Portugal on a handbike, watching vultures flying free, enjoying the villages and landscapes of the Sierra de Cadiz, eating in old railway stations or tasting the wines of the Portuguese region of Dão Lafões, are just some of the experiences to be enjoyed with these products. Discover them! Enjoy them!